I remember as a child my mom and dad making banana fritters, corn fritters and even left over rice fritters. I haven’t had corn fritters in a very long time so I figured I would give it a try and have my kids try them too. I decided to use coconut oil to fry them, just to make it a little healthier. Now I know everyone has different ways of making them and different sauces they use for dipping. I love dipping my fritters in pure maple syrup. The kids loved it and my daughter even said “mommy these are like corn pancakes”. I hope you enjoy. In a medium bowl add flour, sugar, and baking powder. Next mix in egg, milk, salt, and cayenne pepper. Stir until a batter is formed. Now add in corn and shallots to batter. Mix until well combined. In a large skillet add 3 to 4 tablespoons of coconut oil. When oil is heated, take a tablespoon of batter and drop into the oil and cook, flipping to the other side, until golden brown. About 3-4 minutes per side. Place paper towel on plate to drain and excess oils after being cooked. Serve with dipping sauce or pure maple syrup. 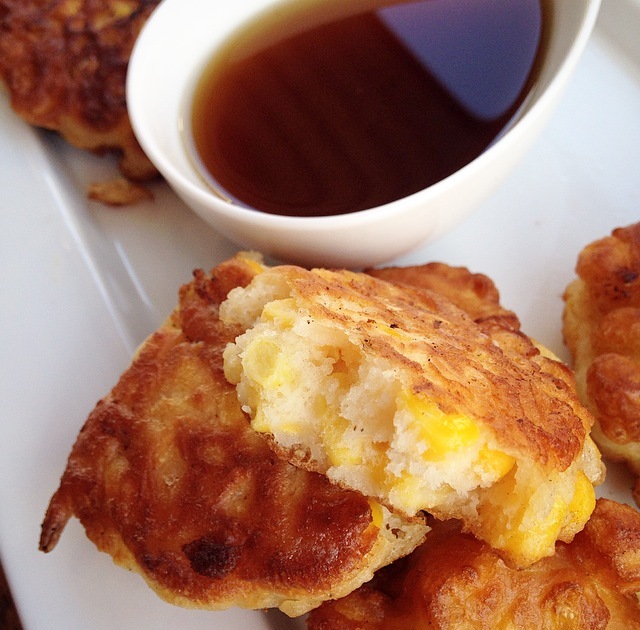 I adore corn fritters and haven’t had them in forever – thanks for sharing and Happy New Year!